For your average ultrarunner, the bedrock training technique is the familiar LSD, or Long Slow Distance, workout. You give up one of your precious weekend days to go really long, stay on your feet for hours, dial in the eating and drinking, test the hell out of your shoes and face the mental challenge of those last couple of hours when the wheels are coming off, but you still have a ways to go. 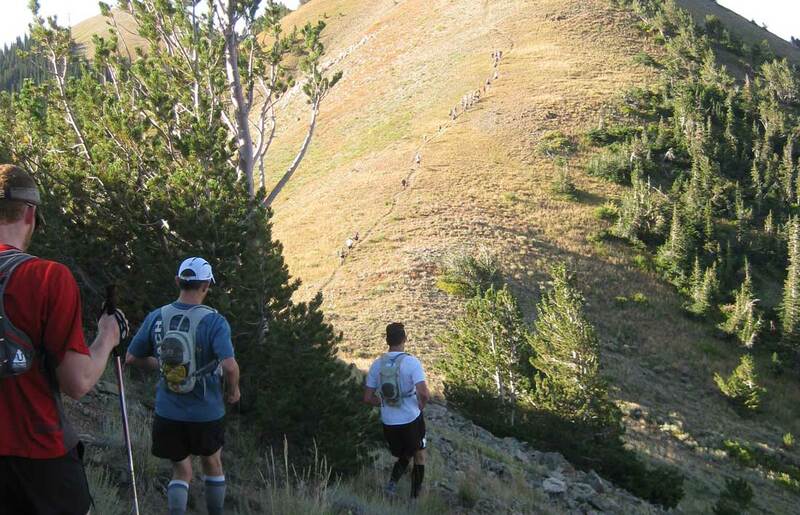 Ultras are often held in very dramatic terrain, and by that I mean in places where there is a lot of elevation change. In fact, many races are practically all elevation change, and the hills are often much steeper than anything you would likely choose to train on or include in a long run. Otherwise strong runners can find themselves struggling with “shot quads” after pushing up and down the steep slopes of races like Western States or the Firetrails 50, where I have personally seen elite runners reduced to walking down hills. Hill training is useful for building the leg strength needed to overcome the problem, but to really nail the training, try substituting one of your LSD runs each month with an “NSD,” that is, a Not-so-long Slow and Difficult run. For an NSD, chose terrain with some serious elevation changes and rugged trails, the steeper the climbs and descents, the better. The trails should look like they’re trying to kill you. You don’t need actual mountains, but hills that afford sustained climbs of 500 to 1000 feet are ideal. In flat areas you might have to substitute stadium stairs, running up the stairwells of tall buildings or even cranking the elevation on your treadmill up to the max setting. Now get out there loaded for bear: lots of water, food, spare clothing, lights if you’re starting early or staying late, and plenty of time so you can stay at it for at least five or six hours. Because of the difficulty of the course, you may not actually cover that much ground, but that is not the point with this workout. You want a high level of effort that you maintain from beginning to end. If the weather is bad or it’s hot out, so much the better. The bigger the challenge, the more you will have to endure and the more your mental toughness will develop, along with that critical leg strength and stamina. How will you know if your workout is tough enough? Any long steep climbs in the second half of your run should feel very hard to handle, like you’re down to taking one step at a time versus the power walking you might have been doing earlier in the run. Also look for soreness in your quads that persists for a day or two after the run. If, on the other hand, you can’t complete your course without throwing up, you might want to scale it back a bit. By working an NSD run into your training about once a month and coupling that with some shorter, sharper hill-work sessions each week, you will ensure that your problem during your next race will not be shot quads. If your goal is just to finish, you can be nearly certain that there is no course out there that will stop you. If you’re gunning for a fast time, you’ll be able to attack the hills with confidence. Excellent advice! I wish I had trained for more “vert” for my first ultra!